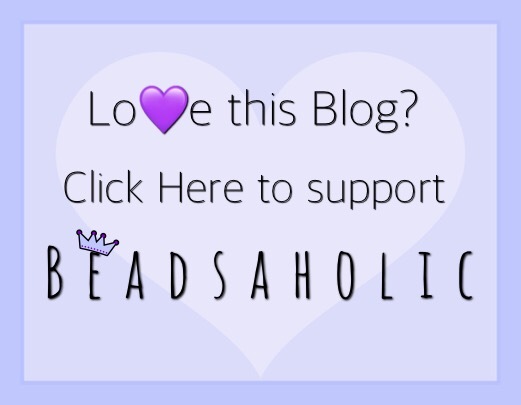 Today Beadsaholic brings a review of the Chronicles Spring Release! If you love ambers then you must check out the inner carved ambers from Chronicles. Recently I introduced Chronicles here on the blog with a few different amber designs (seen here) and today I have a review of Chronicles latest Spring release. I must say I’m addicted and need more of these beauties! Chronicles Amber Golden Magical Unicorn comes in several amber shades with a beautiful carved unicorn in white with a golden horn, as you turn the bead you will find what looks to be a tree with leaves next to the unicorn. Amber sizes vary, however, the one I received measures approximately 15.34 mm high x 12.55 mm wide and retails for $70, prices may vary as each bead is unique. I wanted to make a magical composition with the Unicorn as the focal, seen here with Aqua Hand-made Gift Galaxy, Trollbeads Retired Baby Breath, Redbalifrog Bubble Stoppers on a Trollbeads Twisted Bangle. Chronicles Amber Sakura is a stunning carved golden branch with beautiful white carved Sakura flowers. This is truly a beautiful amber that has been the focal of some of my favorite Asian themed compositions. It is truly perfect for spring and summer coming up. Sizes vary; however. my bead measures approximately 14.08 mm high x 11.80 mm wide and retails for $69, prices may vary. Seen here as the focal with Trollbeads Baby Breath, Aqua Hand-made & Gifts Red barrels, Redbalifrog Frangipani Stoppers on a Trollbeads Twisted Bangle. This was one of my recent Japanese themes that I adore. Seen here with Trollbeads Kimono glass, Spiritbeads Little Monk Do No Evil, Bamboo, Teahouse, Redbalifrog Bubble Stoppers on a Trollbeads twisted bangle. Chronicles Amber Golden Grape has a beautiful carved golden branch with stunningly carved white grapes and leaves throughout. This bead measures approximately 14.62 mm high x 11.86 mm wide and retails for $70, prices, size and color vary. I really love the Golden Grapes in a Pre-wine composition and really wish I had the Pre-Wine Grape bead from Ohm Beads as I think it would go great here with the Golden Grape Amber, Aurora Sweet Grape, Trollbeads Amethyst, Niwa Beads Wings of Beauty, Redbalifrog Bubble Stoppers on a Trollbeads Twisted Bangle. 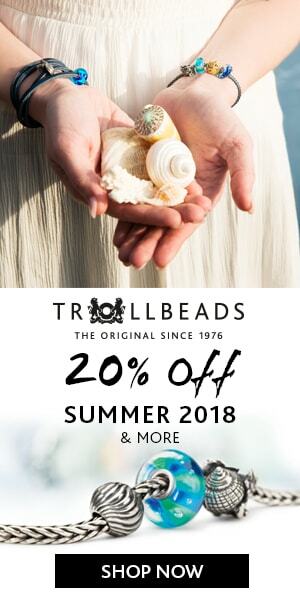 I really love the light-colored carved Chronicles Ambers with Trollbeads Pearls, Flowers of the month, Baby Breath on a Trollbeads Foxtail bracelet. I’ve taken a photograph in the shade, sun and indoors. Look how beautiful these ambers are in the sun! Just wow! And then again here in the indoor studio. The Trollbeads Butterfly lock finishes up this bracelet perfectly. As you can see I like using spacers with these beautiful chunky ambers. This bangle has such a romantic feel with the Chronicles Ambers, Aqua Hand-made & Gift Pink Dried Flower, Trollbeads Baby Breath, Redbalifrog Bubble Stoppers on a Trollbeads Twisted Bangle. These ambers are my maddest joy! No matter the composition they stand out beautifully. Seen here with Trollbeads Daisy, Baby Breath, Niwa Beads Key on a Trollbeads Foxtail Bracelet. I love poetry especially from the 1800’s, like Edgar Allen Poe and Emily Dickinson are some of my favorites. Recently I came across this beautiful collector’s edition Emily Dickinson Poems book and it inspired this bracelet with Chronicles Amber, Trollbeads Lapis, Daisy, Baby Breath, Daisy of April, Argo Studios Snowdrops, Redbalifrog Sunflower, Niwa Beads Key, Aqua Hand-made & Gift Red leaves barrels on a Trollbeads Foxtail bracelet with a Lace Lock. Over all, I need more of these beauties!! Seriously, they are amazing works of art that are unique, and I am truly impressed. They can be worked into any composition and fit all major brands carriers. If you would like to browse Chronicles Amber or shop for any of the Spring release you may do so at any of the following links. Swiss Flower & Gifts – Coming Soon! I love the look of the bracelet including the white pearls. I have a collection of Chronicles amber beads. They are absolutely gorgeous beads. I have some of the ‘plain’ beads and many of the internal carved beads. They are even better in real life than in pictures. Paula I love your inspiration bracelets. We can’t wait to have them to play with and have available for our customers. Should be here in about a week.